A group of cyclists have been labelled "dangerous d***heads" and "ignorant a**holes" after they were caught on camera taking up the whole road and crossing the centre line despite the presence of oncoming traffic. West Auckland resident Nikki Bessem was travelling along Coulter Road in Swanson at 8.40am on Sunday when a group of more than 10 cyclists were hogging the rural and windy road. But instead of riding single-file for her 4X4 vehicle to drive past, the group split off, riding four abreast and making it impossible for a safe pass. At one point during the video, one of the cyclists crosses the centre line around a blind corner and is seen suddenly swerving back onto his side of the road to avoid getting hit. Bessem told the New Zealand Herald the riders didn't "give a s**t about other road users" despite the busy windy road being a 100km/h zone. "I was stuck behind them pretty much the whole way around the windy road. "I was furious. Riding single-file is annoying enough as they never stick to the side of the road, always closer to the middle, but having them riding four in a row is just plain stupid and inconsiderate of others, especially on a 100km/h road. "One of them was on the wrong side of the road coming into a blind corner and a car came the other way. The dude had to quickly get back on the right side of the road or he'd have been hit. Not once did they look behind them to check if a car was there." The West Auckland local was forced to travel behind the group of cyclists for a few minutes at speeds of less than 30km/h. After the video cuts off, Bessem was finally able to pass safely more than a kilometre down the road. She told the Herald riders are notorious for taking up space on Coulter Rd and labelled them "dangerous d***heads that puts other road users at risk". "It pisses me off that we have to pay road-user taxes, ACC and regos but cyclists get to use the roads for free and are such dickheads about it. They were riding dangerously and put others at risk. "Yet they're the first ones to moan when we get a bit close to overtaking them or if one falls off their bike. "Just share the fricken road is all I ask. At least make an effort to hang left." 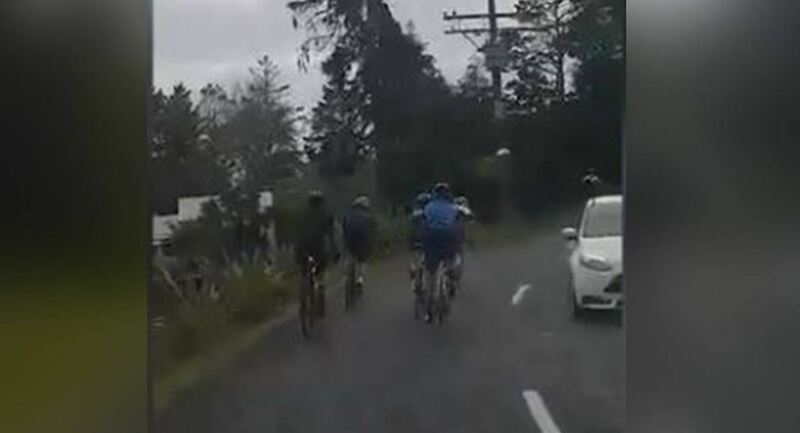 Earlier this month a Piha resident stuck behind two cyclists on a narrow West Auckland road blasted the riders for the "rude" and "entitled" behaviour. Last month motorist Pieter Kruger was driving home to Piha on West Coast Rd when he came up behind two cyclists riding side-by-side, taking up more half of the narrow road and making it impossible to safely pass. Kruger, a cyclist himself, said he was disgusted at the riders' lack of consideration for other motorists, especially on narrow and dangerous roads. Despite revving his engine to let them know he was behind them, they ignored him and continued taking up most of the road leading Kruger to yell out "come on guys, single file". Kruger told the Herald the video shows just one of many issues he faces with ignorant cyclists every weekend. "This is what is happening every weekend in the Waitaks on the roads, West Coast, Scenic, Piha Road. I am a cyclist myself and this is not on." Kruger said the cyclists, who were busy chatting away, were "rude", "careless" and had a "sense of entitlement". The Piha resident believes other motorists wouldn't have been as patient as him and hopes his video will serve as a warning to cyclists to be more respectful on our roads. 100kph is the max allowed speed, not the minimum... perhaps patience and tolerance should be past of our driver licensing test. And this driver is so &^^%$ important, has such a sense of entitlement, he couldn't wait a few minutes to find a place to pass safely?